Black Gold plays at noon, 3 p.m., and 5 p.m. on Lions Field. Their first matchup is against the Astros from Kansas City, who recently placed second at a national tournament and feature a 19-year old Australian pitcher, Dean Halsey. Finally at noon on Bock Field, the Falcons, from Pinckneyville, IL, take on the Wizards of Oz from Silver Lake, Kansas. The Wizards finished 2nd at the Black Gold Classic in 2010 while the Falcons won the 2014 championship after beating nearly every team in the field through the losers bracket and defeating Black Gold twice in a row for the championship. Games continue all day Saturday with Sunday’s single elimination games starting at 9 a.m. on both fields. The championship game starts at 1:30 p.m.
Black Gold recently tied for 5th in the prestigious Kelso Klassic tournament last weekend along with Kelso Fastpitch. 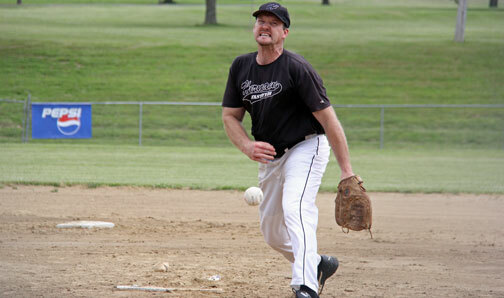 For the second year in a row there will be a mens’ fastpitch softball reunion held at the pavilion near Lions Field starting at 2 p.m. on Saturday. 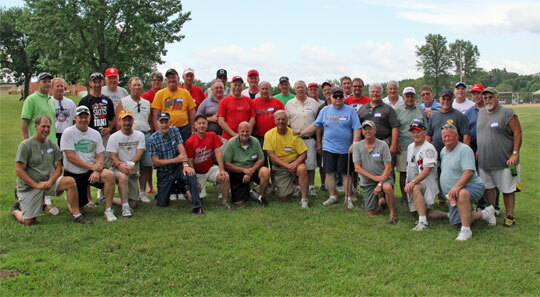 Seventy former players from all over Missouri attended last year. All former players and fans from the state of Missouri are invited. For more information on the reunion contact Pete Purschke (636-583-3377). Full concession stand along with BBQ pork steaks, burgers, brats, and hot dogs will be available both days. For more information on the tournament contact Eric Steinbeck (314-640-6432) or Matt Benz (314-560-4839).